MUHLENBERG, Frederick Augustus Conrad, (brother of John Peter Gabriel Muhlenberg, uncle of Francis Swaine Muhlenberg and of Henry Augustus Philip Muhlenberg, and great–great–grand uncle of Frederick Augustus Muhlenberg), a Delegate and a Representative from Pennsylvania; born in Trappe, Pa., January 1, 1750; pursued an academic course; attended the University of Halle, Germany; studied theology and was ordained by the ministerium of Pennsylvania a minister of the Lutheran Church October 25, 1770; preached in Stouchsburg and Lebanon, Pa., 1770-1774, and in New York City 1774-1776; when the British entered New York he felt obliged to leave, and returned to Trappe, Pa.; moved to New Hanover, Pa., and was pastor there and in Oley and New Goshenhoppen until August 1779; Member of the Continental Congress, 1779-1780; member of the Pennsylvania state house of representatives, 1780-1783, and its speaker, 1780-1783; delegate to and president of the Pennsylvania state constitutional convention in 1787 called to ratify the Federal Constitution; elected as a Pro-Administration candidate to the First Congress, reelected as an Anti-Administration candidate to the Second and Third Congresses, and elected as a Republican to the Fourth Congress (March 4, 1789-March 3, 1797); Speaker of the House of Representatives (First and Third Congresses); was not a candidate for renomination in 1796; president of the council of censors of Pennsylvania; receiver general of the Pennsylvania Land Office, 1800-1801; died in Lancaster, Pa., June 4, 1801; interment in Woodward Hill Cemetery. Papers: In the Alfred C. Berol Collection, 1790, 1 item. Papers: In the Johann Friedrich Ernst Letterbook, 1776-1787, 1 volume. Persons represented include Fredrick Augustus Conrad Muhlenberg. Papers: In the James Monroe Papers, 1792-1797, 5 items. The collection includes an account of an interview by James Monroe, Frederick Muhlenberg, and Abraham Venable with Mrs. James Reynolds concerning her and her husband's dealings with Alexander Hamilton. An annotated list of the collection is available in the repository. Papers: In the Muhlenberg Family Collection, 1752-1847, 14 items. Persons represented include Frederick Augustus Conrad Muhlenberg. This collection forms part of the Miscellaneous Manuscripts Collection. Papers: 1770-1802, amount unknown. Assorted materials include: a diary of F.A. Conrad Muhlenberg dated from October 1770 to August 1774); 5 letters 1773-1794 (Gregg Collection Film); Kirchenrechnungsbuch Falkner Swamp, 1779-1820; a letter to Henry Ernst Muhlenberg, 1780; papers and receipts (3 listed, though one noted as lost) for pew rent, text in German: 1792, 1794 (signed), 1802. Papers: In the Muhlenberg Family Papers, 1779-1854, 2 linear feet. The papers include Frederick August Conrad Muhlenberg's journal. A finding aid is available in the repository. Papers: 1774-1800. 9 letters. Official correspondence. Finding aid in repository. Richards, Henry Melchior Muhlenberg. ""Famous Pennsylvania-Germans: Frederick Augustus Conrad Muhlenberg." Pennsylvania-German 3 (April 1902): 51-60. Seidensticker, Oswald. 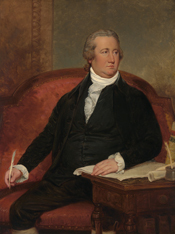 "Frederick Augustus Conrad Muhlenberg: Speaker of the House of Representatives in the First Congress, 1789." Pennsylvania Magazine of History and Biography 13 (July 1889): 184-206. Wallace, Paul A.W. The Muhlenbergs of Pennsylvania. 1950. Reprint, Freeport, N.Y.: Books for Libraries Press, 1970.